2018 marks a century of WW1. Empire troops fought in the most infamous battles of the war, including Ypres and Passchendaele. 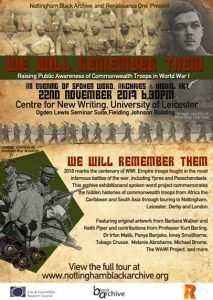 This archive exhibition and spoken word project commemorates the hidden histories of the commonwealth troops from Africa the Caribbean and South Asia. Between September to December it tours extensively to arts centres, libraries and community venues in Nottingham, Leicester, Derby and London. Featuring original artwork from Barbara Walker and Keith Piper and contributions from Dr Irfan Malik, Panya Banjoko, Dr Corinne Fowler and a newly commissioned poem on WWI performed by Michael Brome.